It's been a bit nippy out lately. And by "a bit nippy," I mean the world we once knew has been replaced by an ice-bound hellscape. On the plus side, this means we get to see some of nature's weirder responses to extreme cold. Here are 11 strange things that happen when the temperature gets too low — and why they happen. So imagine this: You go to sleep with a full field of fresh snow in front of your house, only to wake up and find the someone (or something?) has rolled up the layers of snow into a series of small, precisely placed snow-donuts, for some unknown purpose. So what is it? A practical joke? Really tidy aliens? 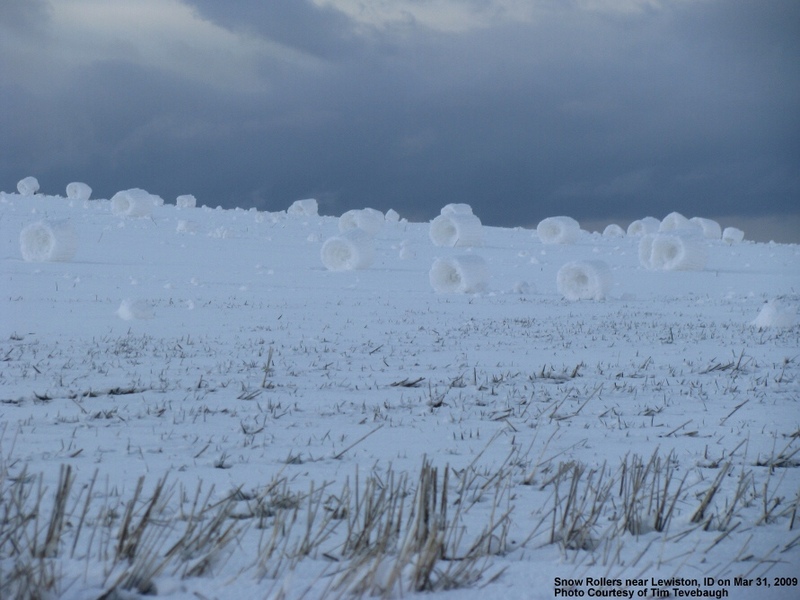 Nope, they're just snow rollers — the tiny, frozen crop circles — or perhaps the snow tumbleweeds — of the winter. For snow rollers to form, there first needs to be a hard layer of snow or ice on the ground when a second snowfall starts. If that snow is accompanied by a strong enough wind, layers of wet snow can be lifted off the ground and gently rolled over and over upon itself until a loose bale of snow forms. Get ready, because this is a weird one — and a noisy one (in case you want to drop the volume settings on your computer before beginning the video). Ice chandeliering is totally gorgeous, dramatic, and just a little bit sneaky (unlike most of the phenomena on this list, this particular winter marvel isn't actually visible until the winter starts to die down and spring begins). As the weather warms up and the ice and ground begin to thaw, oscillating temperatures can cause spontaneous eruptions of ice, as the ice splinters and re-crystalizes seemingly from nowhere, as seen in this video from Minnesota's Medicine Lake. But it's not just the ice itself that makes it so dramatic, it's the sound that it makes — not unlike that of a chandelier smashing. If you've never seen or heard thundersnow before, it might not be a bad idea to borrow this reaction from Weather Channel meteorologist Jim Cantore, who has the correct response. Holy smoke, indeed. The mechanics of thundersnow — an uncomfortable clash between cold air and hot air — are pretty similar to the mechanics behind a summer thunderstorm, though getting air with enough moisture to cause the storm in the winter is unusual. What is unique to thundersnow is the sound. The sound of thunder tends to be muffled due to the surrounding snowfall, which during thundersnow can be pretty extreme — a 1978 bout of thundersnow buried Chicago in a foot of snow in just under 6 hours. The weather around the great lakes gets particularly odd as the temperatures drop. But this collection of boulder-sized ice balls that collected on the shores of Lake Michigan this winter is a particular favorite. So what's going on here? Well, small balls of ice form in the water and are pushed up towards their shore. As they roll over and over against the shore, more and more layers of ice get added until they become easily visible. It's not an unusual site on the shores of the great lake in the winter — but their size this year was, with some of them weighing in individually at more than 50 lbs. Nope, it's not a trick of the camera, these are ice pillars — a natural spotlight generated by the cold air. The temperatures don't necessarily have to be Arctic to see these (though it helps). What's more important is that the night is incredibly, incredibly still. The complete lack of wind allows the tiny, flat ice crystals forming in the air to line up with one another. The result? Light, either from the ground or shining down from above, is reflected upward into a column. Okay, winter, the ice pillars and snow rollers were cute, but now you're just getting aggressive. This ice volcano, along with several of its friends, formed on the edges of Lake Superior. Though it looks just like an ordinary hill of snow, what it really is is a hardened hollow cone of ice and snow strategically placed just at the edges of the lake. As the swells build up beneath it and waves crash against the shore, a rush of ice, water, sleet, and a general slurry of winter misery erupts, to catch unsuspecting passersby. This one you're probably already way too familiar with. 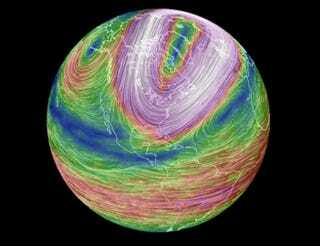 The polar vortex, also occasionally known as an Arctic cyclone, is a dense cloud of unbelievably cold air that circulates around the arctic in a motion similar to a cyclone. The remnants of some of that air traveling downwards is the reason for a lot of the incredibly frigid temperatures we've been dealing with this year. Still, there is something about this particular visual of the polar vortex from air current mapper Earth, of the winds focused down upon the earth like the eye of Sauron, that drives just what we're dealing with home. Not much to say about this one. Just a dog standing on top of a lake of flash frozen fish in the middle of Norway. Okay, maybe there's a little to say. This picture comes for Norwegian island, Lovund, where this school of fish swimming at low tide were unlucky enough to be precisely there when temperatures took a swift and sudden drop, freezing them into place. 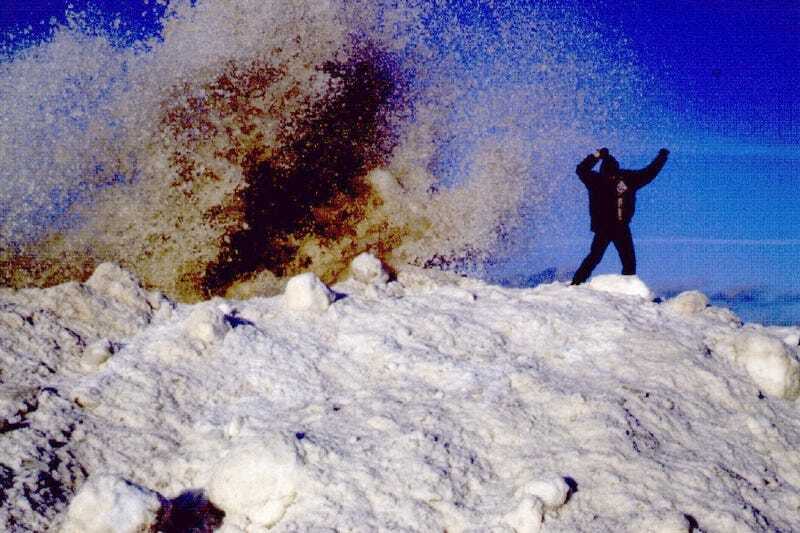 9) Frost quakes / "The cold boom"
Did you know that it can get so cold that you can literally hear it? It's true and it's called a cryoseism, sometimes occasionally referred to as a "cold boom" (not unlike a sonic boom). But that's not the worst of it. A cryoseism — which occurs when ice rapidly expands under ground — can literally shake the ground. Generally, these frost quakes tend to be pretty small and localized, but there are reports of cryoseisms strong enough to shake buildings. Look at all this pancake ice formed along the Drake Passage in the Southern Ocean! The mechanics of this one are pretty similar to what we saw with the ice balls forming on the shores of Lake Michigan: Ice crystals form in the water, and layer upon layer is added as more icy water freezes over top. Because they're not going up against the shore, however, the end result is a series of plate (or pancake) shaped ice circles floating in a sea of slush. Nacreous clouds, also known as mother-of-pearl clouds, are lovely, and they look fairly peaceful rising here above NASA's McMurdo Station in Antarctica. But don't let their beauty fool you — nacreous clouds are actually among the more dangerous winter phenomena on the list, as they are key in the formation of the planet's ozone hole. When temps fall to more than -80 degrees Celsius, these clouds will form high in the air, reflecting sunlight from high above downwards in the characteristic sheen that gives the clouds their name.